I started this tradition several years ago. I solicited prayers from people and then essentially scrapbooked them into an album. The problem with this is that it was extremely labor intensive. Eventually we reached a point where I didn’t have the time to make a prayer book for every senior, so we stopped for a while. During the years we didn’t give out prayer books, I kept hearing from previous graduates. They’d tell stories about taking their prayer books with them to college. They talked about how meaningful it was to look back through them, especially during times when they felt lonely or when they didn’t have the words to pray themselves. After hearing this consistently, I decided we had to figure out how to create the prayer books in a less labor-intensive way. So I bought 8X8 Memory Books with Top Loading Pages, a ton of 8X8 cardstock paper, and some graduation stickers. I then asked key people in the lives of these seniors – parents, other staff members, Sunday school teachers, adult leaders, etc – to write out a prayer for each senior on one-side of an 8X8 paper. 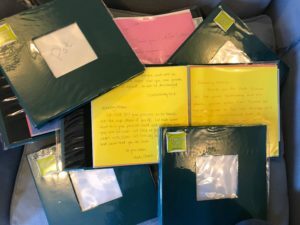 To distinguish these prayer books from year books, I asked people to write prayers – NOT letters to the seniors – and to include their name at the bottom of the page so that seniors could tell who had written them. We then embellished sheets with stickers and stuck them into the memory books, making one for each senior who’s active in our ministry. We then asked students to do the same thing and even gave them time to do so at several of our youth group gatherings. Finally, we assembled the prayer books… In a fraction of the time that it used to take me to make them. The result is a beautiful prayer book – filled with meaningful and formative words for our seniors that they’ll take with them… As reminders of how much our community love and cares for them, and how much God does too.